In the wake of the Newtown tragedy, Ann Curry had an idea wrapped in a question: why don't we all honor the victims with acts of kindness? It goes without saying that the news of the Sandy Hook tragedy stopped us in our tracks late last week, and its impression is indelible. Many of us have been wondering what, alongside donating to the United Way charity set up to assist the victims' families, we could ever possibly do to help. True to her humanitarian roots, journalist Ann Curry was asking herself the same thing when, within that question, another arose: "What would happen if all of us committed to performing an act of kindness to honor each child lost?" Quickly taking to social media, Curry shared her idea, wondering if it might be replicated throughout the country and perhaps across the world. The world, it turns out, is responding in spades. "I donated to Autism Speaks via the CFC Campaign at work! 26 pay periods!" one person tweeted. "Making and donating 200 free clinic patients Xmas dinner tomorrow night. Pretty excited about it," tweeted another. "Each day I am including a card with a specific victim's name," another shared on the project's Facebook page. "Today was in honor of James. I taped money to a pop machine and a snack machine so someone could enjoy a snack." 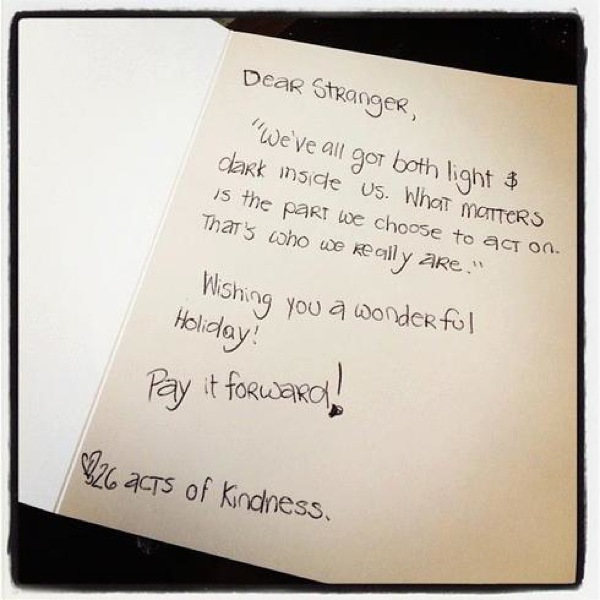 One participant posted a photo of a card she was leaving on a windshield with a Starbucks gift card tucked inside. Elsewhere, a teacher tweeted Curry directly about her pride in her students' enthusiasm: "@AnnCurry it's spreading through our junior high school! #proudteacher." While the campaign has been labeled with the number 26, and although the most often-used hashtag thus far has been #26acts, some participants are choosing to perform 20 acts of kindness in honor of the children of Sandy Hook Elementary, while others are committing to 28 acts to commemorate every life lost. All details aside, the sentiment is the same; to draw upon an old proverb, "It is better to light a candle than to curse the darkness." It all started with a tweet: "Imagine if all of us committed to 20 mitzvahs/acts of kindness to honor each child lost in Newtown. I'm in." Will you be participating with your kids?